Max Brenner and a Return From Chocolate ExileOne of the most famous names in chocolate is back — after a half-decade ban — with a new shop dedicated to cacao. Who Is She, Actually? A Guessing Game in Union Square ParkWe asked strangers to size each other up. 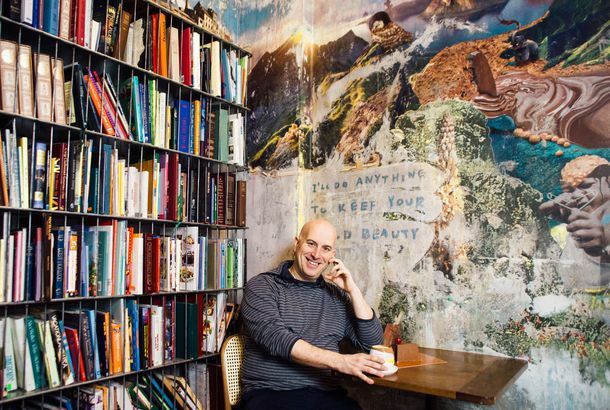 Union Square’s Iconic Coffee Shop Will CloseAfter 28 years in business. Sweetgreen Is Opening 3 More Locations In New YorkThe salad empire will expand to Columbia University, the Upper West Side, and Union Square. Bánh Mì x Cuban SandwichNicely done, Num Pang. Homestyle Union Square Restaurant Chat ’n Chew Served Its Final Pork ChopThe home of crispy mac and cheese and Coca-Cola cake is apparently closed. Manhattan’s Very First Dairy Queen Opens ThursdayDon’t forget about Orange Julius, which is also part of the opening. Blizzard Time: Manhattan’s First Dairy Queen Opens This MonthThe location is serving a custom “Big Apple Blizzard” at its Union Square location. First Look at Union Square Pavilion, Now Open With Outdoor SeatingAfter six years of delays. Six! The Pavilion Opens in Union Square After Years of DelaysReservations are being taken online. Man Arrested for Taking Up-Skirt Video in Union Square Subway StationHave a vigilant spring, ladies. Wayne Nish Leaves Simon Oren’s Pavilion in Union SquareThe Pavilion in Union Square Park has been years in the making. Plans for Union Square Park Restaurant ResumeThat “Chef Driven Market” may be opening sometime this decade. What to Eat at All’onda, Michael White Alumnus Chris Jaeckle’sIt officially opens tonight in Union Square. Man Run Over by Subway Is Completely FineHe only bruised his hand. Heartland Brewery Closing USQ LocationThe brewery’s original location will close at the end of the year when its lease expires. Simon Oren’s Chef Driven Market Will Open in Union Square, After AllShouldn’t it be called Greenmarket-Driven Market, or something? Skateboarder Killed by Truck Near Union SquareEyewitness accounts vary, but no criminality is suspected. Union Square Is Getting a Zip Line for SummerWhat could go wrong? Kibo’s KlosedThe Japanese Grill calls it quits after just eight months. Union Square’s ‘Methadone Alley’ Is Back, Complete With Police CrackdownThe rites of spring. Casa B Launches Late-Night Menu This WeekendUnion Square’s favorite tapas den introduces nocturnal delights. Where Should Somerville Food Trucks Park It?The debate rages on this evening at Somerville’s City Hall. What Comes After May Day for Occupy Wall Street?May 1 brought big crowds and good vibes, but no obvious path forward. Neil Gaiman Tweets, Finds DinnerTweeting for dinner in Boston. Occupy Wall Street Figured Out How to Have SleepoversProtesters slept outside legally around Union Square last night. Something’s Wrong at RonnarongGoodbye, Thai. Trayvon Martin’s Parents Will Attend the Million Hoodie March in NYCThe 17-year-old’s mother and father will join Occupy Wall Street tonight. Five Napkin Burger’s First Downtown Location Opens Next WeekThe gourmet greasy spoon opens on 14th Street. 5 Napkin Burger Headed to Union SquareIt’s still in plywood, but will reportedly open soon. Take a Peek at Casa B’s New, Nice-Lookin’ Prix-Fixe MenuIn 2012, Union Square is the spot to sup (for $65, prix-fixe). Backbar to Open by Friday, With a Truly Lethal ManhattanUnion Square’s about to get a lot tipsier. Union Square Is a ‘Lawless City Within a City’Apparently, it’s worse than ever out on 14th Street. A Throwback French Booze Party at Astor Center; Alex Guarnaschelli Hosts aPlus: Ralph’s Famous Italian Ices comes to Manhattan, a special at Union Square Café, and more, in our daily roundup of neighborhood news. Man Falls Between Subway and Platform in Union Square, Gets Pinned by HydraulicsThis is an awful nightmare come true. The Flatiron District and Union Square Are Crawling With Venture CapitalistsAt least at lunchtime.